Eurozone activity is crumbling at a steep pace. A close look at Germany provides all the information you need to understand that it’s not just the club-med states that are in deep trouble. The Markit Germany Services PMI® shows Sharpest drop in German services activity since July 2009. Final Germany Services Business Activity Index at 48.3 in August, down from 50.3 in July. 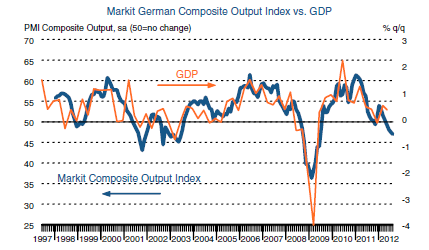 Final Germany Composite Output Index at 47.0 in August, down from 47.5 in July. August data pointed to a renewed contraction in German service sector business activity, following a slight expansion during the previous month. This was highlighted by a fall in the final seasonally adjusted Markit Germany Services Business Activity Index from 50.3 in July to 48.3, its lowest since July 2009. Service providers widely linked the downturn in business activity to weaker spending by businesses and consumers. This contributed to a drop in new business intakes for the fifth consecutive month during August. Latest data pointed to a steep fall in volumes of new work, and the rate of contraction accelerated to the fastest since June 2009. 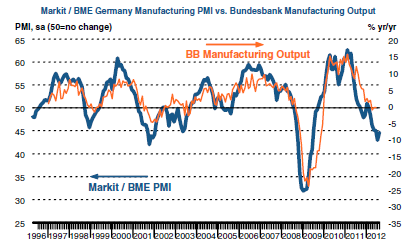 The Markit/BME Germany Manufacturing PMI® shows new export work falls at fastest pace since April 2009. The final seasonally adjusted final Markit/BME Germany Purchasing Managers’ Index® (PMI®) posted 44.7 in August, up from a 37-month low of 43.0 during July. August data pointed to a fall in production levels for the fifth month running, and the rate of expansion remained relatively steep in the latest survey period. Intermediate goods production dropped particularly sharply in August, while only the consumer goods sector recorded an expansion of output. The Markit Germany Construction PMI® shows Construction activity down at slower rate, despite fastest fall in new work since February. future performance deteriorated further. Elsewhere, input cost inflation slowed to a two-and-a-half year low. German constructors remained pessimistic about the 12-month outlook for activity levels in August. Moreover, the overall mood was the most downbeat since last December. A number of factors were noted by respondents as having the potential to weigh on output in the year ahead, particularly low public sector spending. This trifecta of news from Germany, particularly new orders which are a leading indicator for GDP, suggests economically speaking the eurozone recession is poised to strengthen in a very major way.